Dosto Jaise Ki Ham Previous Post Me Jana Tha Ke Facebook Account Permanently Delate Kaise Karte Hai. Agar Apko Fb Account Delete Karni Hai Toh, Asani Ke Sath Delate Kar Sakte Hai. Yadi Apko 14 Days Ke Wait Nhi Karna Hai Toh Upper Diye Gaye Link Me Jake Kar Sakte Hai. Facebook Deleted Messages Ko Recovery Kare. Issi Tarah Facebook Friends Ko Automatic Birthday Wish Kar Sakte Hai. Our Agar Apko Facebook Post Par Likes Comments Ya Freinds Request Badhani Hai Toh Yaha se Aap Bina Kisi Software (Autoliker) Wagaira. Ke Begair Kar Sakte Hai. 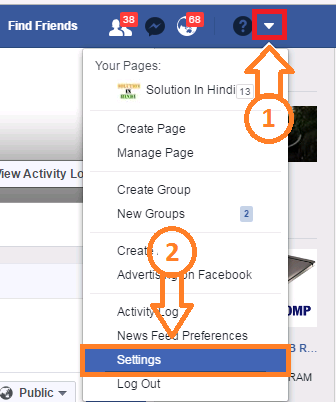 Facebook Tips & Trick Ke Liye Facebook Label Par Jaye. Today Ham Baat Karenge Facebook Account Deactivate Kaise Karte Hai. Facebook Ke Bare Me Toh Lagbhag Sabhi Ko Pata Hai Facebook Kya Hai. Our Kuch Friends to Facebook Me Hamesha Active Rahte Hai. Kyu Ki Facebook Hai Hi Ayse Interested, Our Kisi Business Ko Free Me Promotion Karne Ke Liye Bhut Hi Badhiya Platform Hai. Agar Apko Business, Fun, Community Facebook Page Create Karni Hai Toh Yaha Uski Jankari Diye Gaye Hai. Facebook Account Deactivate Karne Se Kya Hota Hai? Facebook Account Deactivate Kaise Kare? 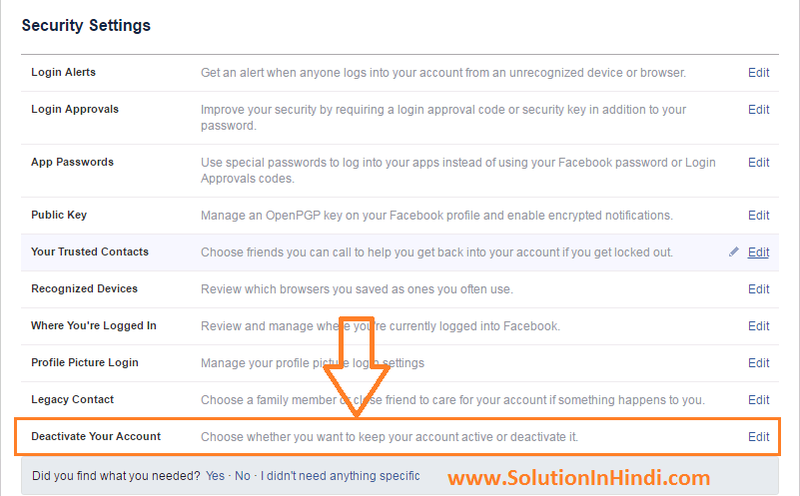 Pc Se Facebook Account Deactivate Kaise Kare? 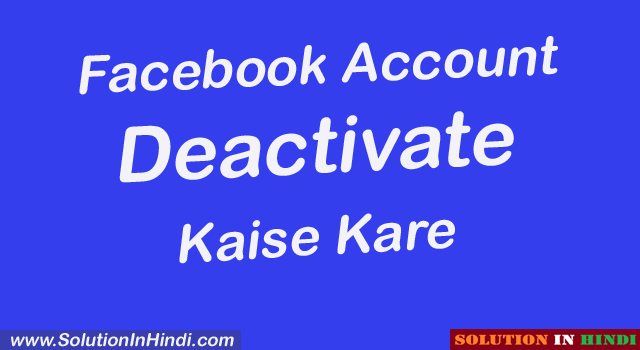 Facebook Account Deactivate Karne Ki Toh Bhut Sare Reason Ho Sakte hai, Jaise Ki Main Pehle Hi Bata Chuka Hu, Fb I’d Deactivate Karne Se Apke Profile (Account) Show Nhi Karega, Koy Status, Images, Video, Kuch Bhi Show Nhi Karega, But Agar Kisi Ko Tag Karke Rakhenge Toh Woh Uske Timeline Me Sirf Show Hoga. Jab Tak Apke Account Deactivate Rahega Tab Tak Koy Messages, Friends Request, Notification, Kuch Bhi Nhi Ayegi. Toh Aaj Me Apko 2 Method (Tarika) Bataunga. 1st Mobile Version Me Facebook Account Deactivate Kaise Kare. 2nd (Laptop/Computer) Pc Version Me Facebook Account Deactivate Kaise Kare. Toh Chale Jante Hai. Sabse Pehle Facebook Account Login Kare. Login Ho Gaye Hai Toh Setting Me Jaye. Ab Settings Key Security Par Click Kare. Security Me Aa Gaye Hai Toh Niche Deactivate Par Click Kare. Kisi Ek Deactivate Reason Choose Kare. Ab Niche Deactivate Par Ok Kare. Done! Apke Account Deactivation Successful Ho Chuka Hai. 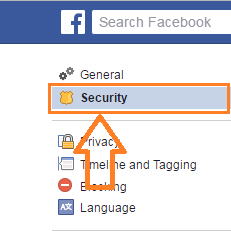 Agar Ap Facebook Settings, Security Me Nhi Jaa Paa Rah hai, Toh Yaha Settings Ya Security Par Click Karke Jaa Sakte Hai. Or Yaha Deactivate Account Par Click Karke Directly Jaa Sakte Hai. Agar Apko Kissi Step Me Samajh Me Nhi Aaye Toh Comment Karke Bata Sakte Hai, Ya Phir Niche Video Dekh Ke Asani Se Facebook Account Deactivate Kar Sakte Hai. Browser Version Me Bhi Facebook ID Deactivate Karna Bhut Hi Simple Hai, Niche Dye Gaye Step By Step mere Sath Follow Kare. Sabse Pehle Aap Facebook Account Sign In Kare, Jis ID Ko Deactivate Karni Hai. Ab Upper Right Side Me Ek Arrow Hai Us Par Click Kare. Phir Niche Settings Par Click Kare. Setting Me Aa Gaye Hai Toh Ab Left Side Me Security Par Click Kare, Samajh Me Nhi Aye Toh Niche Screenshot Dekhe. Deactivate Your Account Par Click Kar Diye Hai Toh Phir Se Apko Deactivate Your Account Par Click Karna Hai. Kuch Iss Tarah. Ab Yaha Apko Password Enter Karni Hai Jo Apke Facebook Account Ki Hai. Phir Continue Par Click Kare. 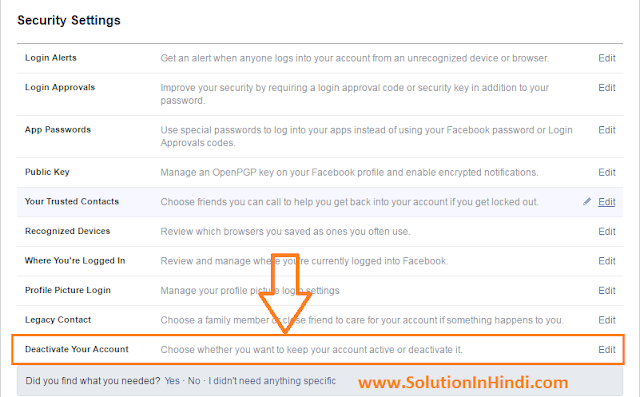 Yaha Apko Pucha Jayega Ke Aap Sure Hai Ke Apko Facebook Account Deactivate Karna Hai? Agar Apke Sawal Yes Hai Toh Niche Deactivate Now Par Ok Kare. Deactivate Now Par Click Karte Hi Apke Samne Kuch IssTarah Ke Page Open Hoke Aayega. 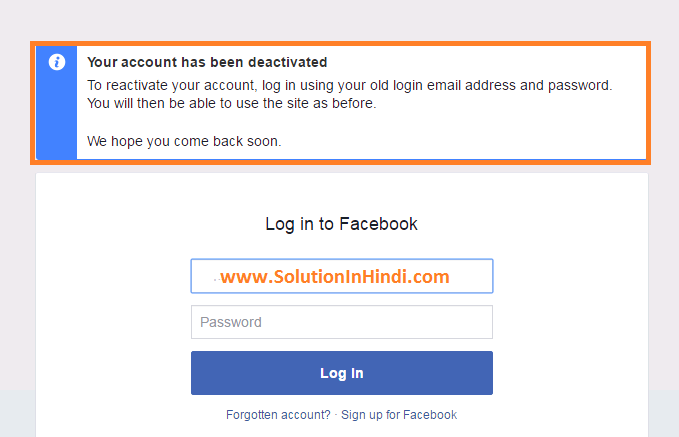 Your Account Has Been Deactivated Aaya Hai Toh Apke Facebook Account Deactivation Successful Ho Chuka Hai. Agar Apko Kabhi Facebook Account Reactivate Karni Hai Toh Apko Sirf Username Or Password Dalke Login Karne Se Wapas Apke FB I’d Apko Mil Jayega. Ab Aap Facebook Account Deactivate Kaise Karte Hai Completely Sikh Gaye Hai, Phir Bhi Agar Koy Sawal Hai Toh Comment kar Ke Bata Sakte Hai. Our Han Apne Friends Ke Sath Share Karna Na Bhule, Computer, Mobile, Earn Money, Social Media, Facebook, YouTube, WhatsAap, & Internet Ki Puri Jankari Hindi Me Sikhte Rahe Or Dusre Ko Bhi Sikhate www.solutioninhindi.com Ke Sath Update Rahne Ke Liye Subscribe Kare. And Other Social Site Link Niche Hai. Thank You Perwez Alam Bhai, Visit Karte Rahe Update Milte Rahega. really such a great article, thnks for sharing. Thank You Gaurav Bhai & Visit Again..